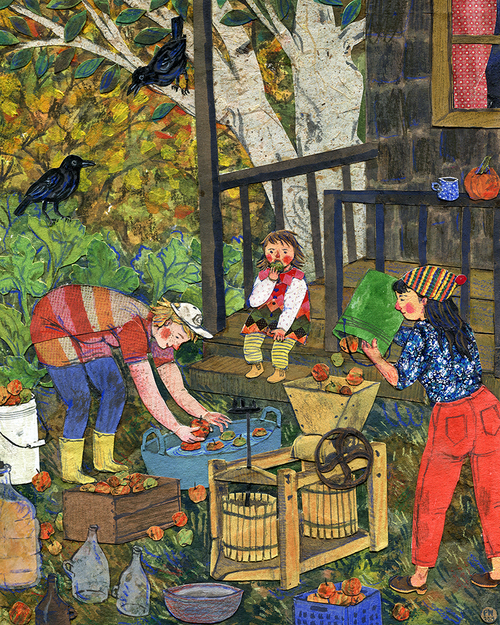 This week we’re featuring special artwork from Northwest artist, Phoebe Wahl. Phoebe is an artist whose work focuses on themes of comfort, nostalgia and intimacy with nature and one another. She grew up unschooled in Washington state, and credits her ‘free range’ childhood in the Northwest for much of her inspiration and work ethics. Phoebe graduated from Rhode Island School of Design in 2013 with a BFA in Illustration, and currently lives in Bellingham, Washington. Her first children’s book Sonya’s Chickens (Tundra) was the recipient of the Ezra Jack Keats Book Award for New Illustrator, as well as a Kirkus star, and was listed by School Library Journal, Kirkus and HuffPost Books as being one of the Best Children’s Books of 2015. Phoebe is represented by Jennifer Laughran of Andrea Brown Literary. …perfectly articulated by the original and ever so wise, Winnie the Pooh. We’ve now said goodbye to our shared gardens; they’ve been tended to, cared for, and put to sleep for the cold winter to come. How lucky are we that we have something to miss and reminiscence through the snow. We say goodbye to our gardens, to these places that we tend, and to the neighbors we tend with, with the luxury in knowing that we will be seeing it all again come spring. In the meantime, we hope you continue to enjoy your garden goods through the winter. Last week we celebrated the hard work and devotion that our volunteer garden Leadership Committees put forth with a dinner party. Here is a recipe from the event: Community Gardens Minestrone Soup to enjoy the fruits of your labor. This is a go-to for me; it doesn’t take long, and usually doesn’t require a trip to the grocery store. You can be creative with what ingredients you have on hand. Veggies - This is more of a “kitchen sink” soup, so use what you like or what you got! I’ve found that anything from Brussels sprouts to kale to spinach to beets to peppers all tastes good and blends well. If you are worried about cooking times check out the Kitchn’s guide to making soup with almost any vegetable. FRESH curly parsley – a large handful, chopped. You can be generous with this; I usually use the entirety of one produce bunch. 1 bag of whichever noodle you like, I usually use macaroni, shell, or whatever is in my pantry so long as its bite-size, i.e., not spaghetti, angel hair, etc. Gluten free are fine too. Cook pasta in separate pot. Once pasta is cooked, drain and run under cold water until it is no longer steaming and set aside. On medium-high heat sauté onions in olive oil until slightly tender in large stockpot. Add garlic and cook for an additional minute or until fragrant. Once sautéed, add carrots, potatoes and any other starchy or hardy veggie that needs time to cook. Once all veggies are tender, turn heat to medium and add tomatoes and beans and stir. Add all dried spices plus salt and pepper and bring mixture to a soft boil while stirring. Add liquid broth ingredients on medium heat; bring mixture to a soft boil once again. This is your time to add spices and liquids to your taste. If it’s bland, add a pinch of salt, more herbs you desire, and a teaspoon or two of vinegar and wine. If it’s too salty or strong, dilute with a cup of water. Repeat this process as necessary. *The beauty of this soup is that it is very forgiving. Once you’ve seasoned to taste, bring soup to a low simmer for 20 minutes. Stir in pasta and parsley five minutes before serving. Thanks all and see you next season! **All quotes from “Quotations: Gardening, Farming, Dirt, Soil.” The Quote Garden. Last modified July 16, 2016. Accessed November 1, 2016. http://www.quotegarden.com/gardens.html.